Published: March 6, 2014 at 12:06 p.m. Updated: March 6, 2014 at 12:17 p.m.
Best fits for five top QB prospects: Is Daniel Jones the future in New England? Khalil Mack continued to enhance his draft chances with a tremendous pro-day workout Tuesday. I believe he is one of seven guys with a chance to be the No. 1 overall pick by the Houston Texans. But here's why I wouldn't take him there. Mack certainly has the ability to be the first pick of the draft. He's a very competitive player who was highly rated even before his senior season. He has put up some tremendous numbers for his position in pre-draft workouts, including a 4.55 time in the 40. At 6-foot-2 1/2 and 247 pounds, Mack's speed and athletic ability for a player of his height and weight is off the charts, probably in the 99th percentile for his position. But in order to determine a player's draft positioning, you have to understand the whole draft, and you have to factor in the importance of a player's position. I don't think a team could take a linebacker with the No. 1 overall pick, considering the position today just isn't as important as others such as left tackle. If the Texans end up taking Mack at No. 1 overall, they'd be betting that he could become an elite pass rusher in the NFL. Mack looks like he can be that, but you never know for certain. Now if you knew for sure that Mack could be a guy who would get you 15 sacks a year, then you would consider using the first pick on him. But the position he plays is no longer one that is highly regarded, or as closely connected to the success of a team, as it once was. 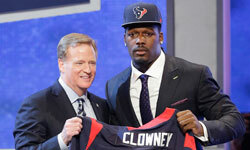 » 2014 draft grades: How did each team fare? This has nothing to do with Mack being from a smaller school. When I was with the Dallas Cowboys, I took a small-school guy No. 1 overall in the 1974 draft, Ed Jones from Tennessee State, who played 16 seasons and made three Pro Bowls. I also took a linebacker named Thomas Henderson of Langston in the first round in the 1975 draft, and he starred for us as a rookie. The fact that Mack played at Buffalo should have no bearing at all on teams' evaluation of him. We're not looking at his school, we're looking at his ability. With that in mind, although I wouldn't take Mack with the top pick, I don't think he'll get past Tampa Bay, which has the No. 7 pick. That would be a great thing for the Mid-American Conference. Last year, the MAC had a player picked first overall in Central Michigan's Eric Fisher, who went to the Kansas City Chiefs. This year, Mack will give the conference a top-10 overall pick. For the MAC, it'd really be something special. Earlier this week, when word got out that the Cleveland Browns, who have the No. 4 pick in the draft and need a quarterback, did not interview Johnny Manziel at the NFL Scouting Combine, I was reminded of the year the Denver Broncos drafted quarterback Jay Cutler. The Broncos liked Cutler enough that they traded up a few spots to take him, but interestingly, he was never brought in for a visit and was never interviewed by the team before the draft. When head coach Mike Shanahan was asked why this was the case, he explained that he didn't want to alert the other teams to Cutler and purposely avoided bringing Cutler in. That could be the Browns' rationale, too, with Manziel. Plus, I think the Browns have already done their homework on quarterbacks -- tracing their history, talking to the players' high school coaches and college coaches, etc. There's a good chance that they already know enough about Manziel and didn't feel an interview was needed. Follow Gil Brandt on Twitter @Gil_Brandt.